While charging the battery by running the application, you can set an alarm. 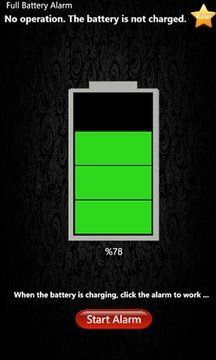 When the battery status is 100%, the application will alert alarm and you can remove from charging. you can prevent unnecessary power usage, saves time and allowing you to save the battery lifetime. - Plug in your phone and run the application. - Click "Alarm Start" button. 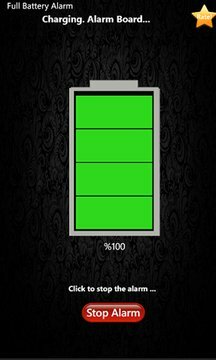 While charging the battery, it will check and will warn you when the battery full in less than 1 minute. NOTE : For English version, your telephone language should be English. -Some problems are fixed in Alarm. -Alarm Synchronization problem would be fixed. - While you put out from charge, "Charging" status will not show. - While alarm is not activated, "Charging" status will not show.